Sergeant Carl F. Roehrich was born in Bridgeport, Fairfield County, Connecticut. He was the oldest of three sons of Charles Roehrich, the owner of a successful business called City Line Florist in Bridgeport. After losing their eldest in WWII, the youngest son of the Roehrich family, Bill, served in the Korean Conflict as a captain in the U.S. Army." The eldest of three sons, Carl was exceptionally bright, skipping a grade in McKinley School in Bridgeport's East End and graduating from Harding High School at the age of sixteen. Later he graduated the University of Massachusetts' School of Agriculture. In truth, Carl Roehrich was something of a boy genius. Taking up the violin at 10, within two years he was proficient enough to be invited by conductor Frank Foti to perform with the predecessor of the Greater Bridgeport Symphony Orchestra. At some time later Later Roehrich mastered the trumpet and took up acting. Drafted in the fall of 1942 at age 19, Carl Roehrich was hungry for action. He signed up for paratrooper training at Fort Benning, Ga. Instead of going overseas like most of his jump school classmates, Carl was selected to become a jump instructor, and eventually achieved the status of "jumpmaster," charged with training classes of new paratroopers. In just a few months he was promoted to sergeant. As a jumpmaster, Roehrich had to make five practice jumps with each of his classes. By late 1944, he had trained six classes and made more than 30 parachute jumps. Then, sometime in late 1944, Roehrich decided he had enough of training and making practice jumps. He was tired of watching his students go off to Europe and the Pacific to fight for their country. With the war in Europe winding down, the 20-year-old wanted to do his part for the country. He wanted to experience combat for himself, ... Carl volunteered and jumped with the 17th Airborne Division. 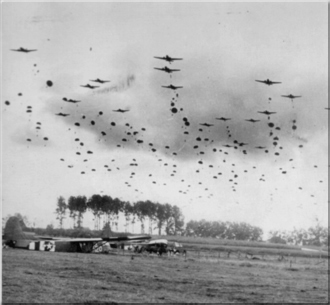 Operation Varsity was one of the last large airborne operations towards the end of World War II, intended to gain a foothold across the River Rhine in western Germany as a part of Operation Plunder. It involved two divisions and 1,700 transport aircraft. This was the single largest airborne drop in history, and is used at West Point as "the" example of how an airborne operation should be executed. The operation took place on 24 March 1945, led by the British 6th Airborne Division (including Canadian troops) and the US 17th Airborne Division. 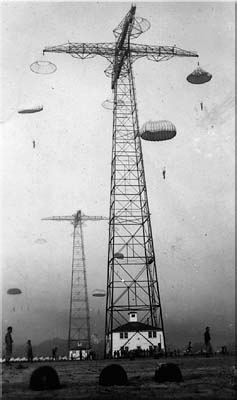 The US 82nd Airborne Division had originally been scheduled to participate in the jump as well until a shortage of transport aircraft forced the use of just two divisions. Taking off from marshalling areas in France, the 17th Airborne dropped into Westphalia in the vicinity of Wesel, and on the 25th, the Division had secured bridges over the Issel River and had entrenched itself firmly along the Issel Canal. Moving eastward, it captured Haltern, 29 March, and Münster, 2 April. The 17th entered the battle of the Ruhr Pocket, relieving the 79th Infantry Division. It crossed the Rhine-Herne Canal, 6 April, and set up a secure bridgehead for the attack on Essen. The "Pittsburgh of the Ruhr" fell, 10 April, and the industrial cities of Mülheim and Duisburg were cleared in the continuing attack. 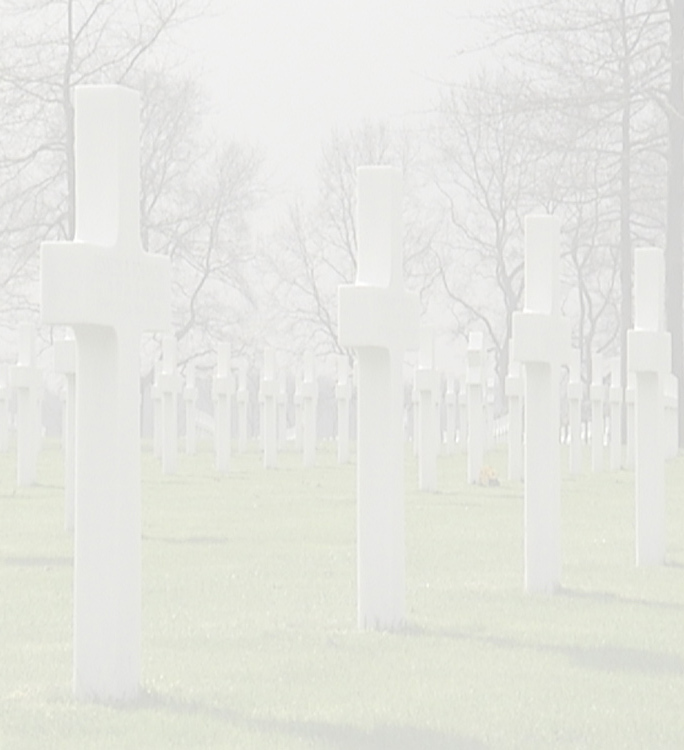 March 24, 1945 - killed in action - .... 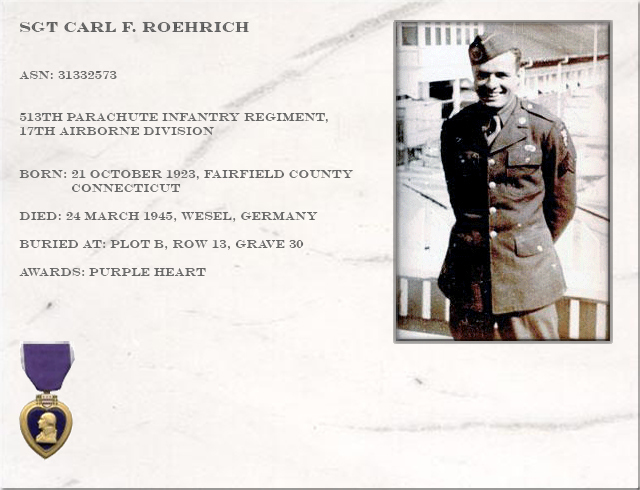 According to information past down from his father, Carl Roehrich was shot and killed during his jump. He had close to 50 jumps before his last one.